First there were cupcakes, then macarons. Of course both of these “fads” ended up not being fads at all but new food categories in New York with legitimate staying power. 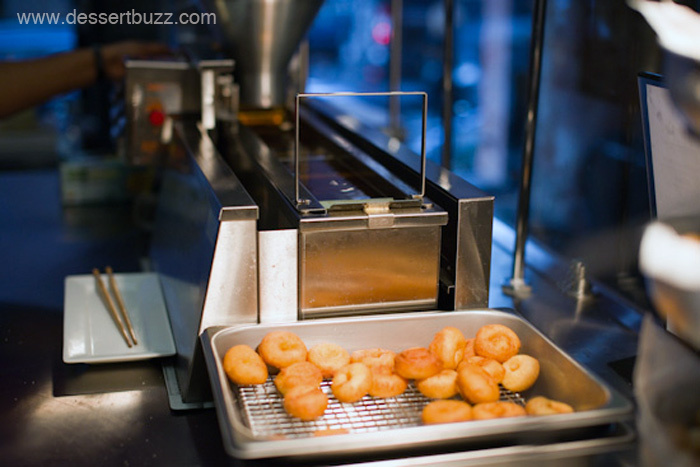 During this time, the Doughnut Plant opened a new location in the heart of Chelsea and took top honors by attendees of the 2011 New York Food and Wine Sweet event, beating out a half-dozen cupcakes and a host of NYC’s top pastry chefs. All this just confirms what we many entrepreneurs already know–New York is a city in love with food like no other. And there is always room for the next great idea. Enter Doughnuttery. Doughnuts hot off the oil driven flume ride. To me, Doughnuttery doughnuts are more a distant cousin of macarons than cupcakes–they’re a little more artisanal, a little more novel, I think more of pastry chefs being involved with their creation vs. bakers and most importantly (probably owing to their small size) you can eat a half dozen or so without feeling like a pig. Right now, Doughnuttery sells two lines of mini-doughnuts, “classic” and “sugared”. 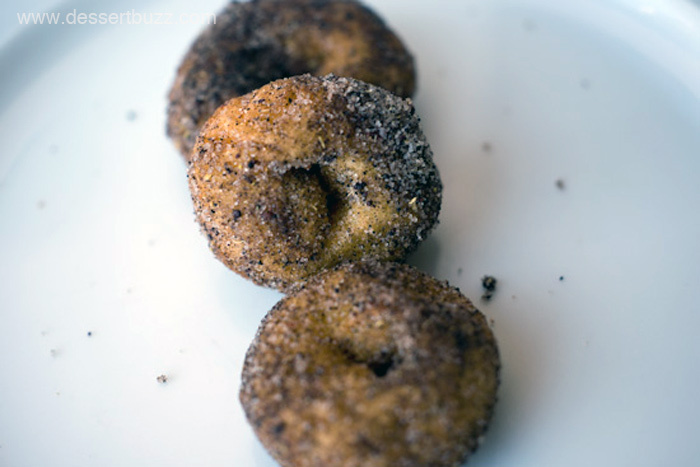 Classic consists of cinnamon sugar coated, old fashioned glazed and powdered. The sugared line is really where Doughnuttery breaks new ground. There are twelve different, well-thought-out sugar mixes such as Cherrypop made with sour cherry and ancho chile or Cacaoboy made with cocao nibs, mesquite and black sugar. Hot doughnuts come right off machine and then get the “Shake N’ Bake” treatment in a wax bag, coating them with one of the custom sugar mixes. 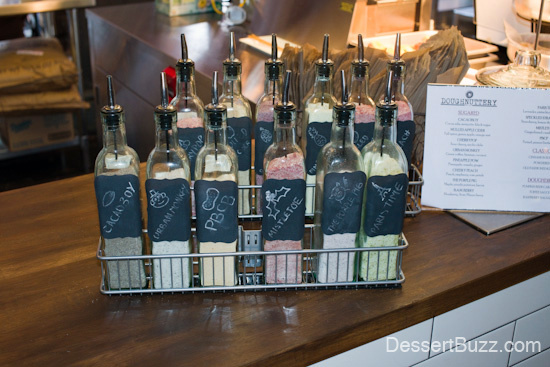 You may also purchase special “Dough dips” – these are small containers of dipping sauce designed to go with the sugared doughnuts. I tried about half the sugars and they were surprisingly different from one another–some were tangy and some were even tart. I recommend the Paristime sugar mix along with the Balsamic dip. I also really enjoyed the pumpkin beer caramel dip (They also had a toffee dip). One of coolest things about Doughnuttery is that every single doughnut sold is made right in the shop, at the counter in front of you. The machine is fun to watch too. 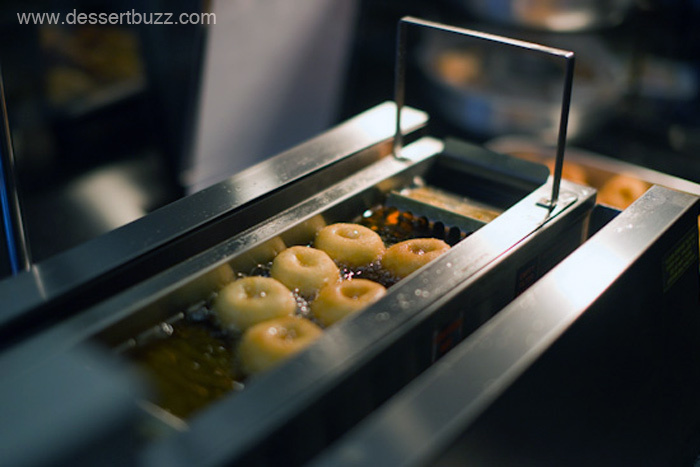 After the doughnut is dropped into the oil, a small paddle wheel creates a slight current and the doughnut gently floats down the hot oil path like it’s on some kind of lazy river amusement park ride, before getting flipped over and out into a basket. 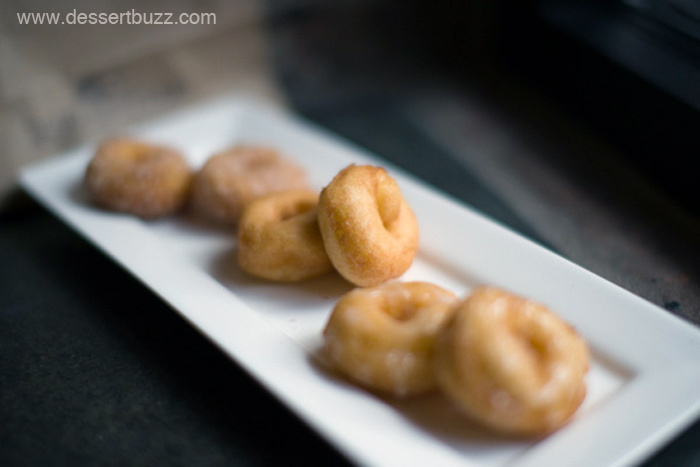 There are all kinds of cool sugars to have on your fresh mini-doughnut. Sugared doughnuts are $6.00 for half a dozen and $9 for a dozen. The Classics are $5 for half dozen and $8 for a dozen. Dips are a $1.50 and hot cider is $3.00. The Doughnuttery is located in Chelsea Market at 75 9th Ave. (They are in the same area as Jacques Torres) Their Facebook page is here. 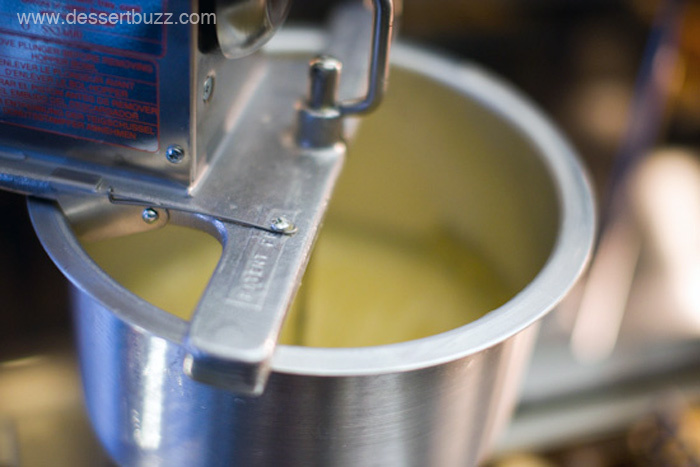 Follow DessertBuzz on Twitter to stay up-to-date on all New York City dessert news. 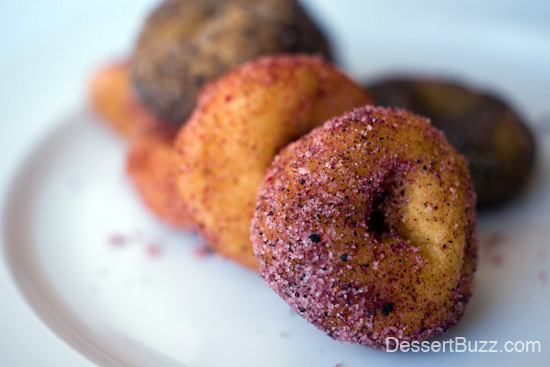 This is exciting news.Im a big fan of sweet treats and doughnuts seem like the next big thing for NYC. @Kerri Yes, doughnuts have been sneaking up the ladder of popularity as of the last few years. @Katie – Thanks! Fun concept. I predict Google will force you to purchase another machine. The City Sweet Tooth » Sweet Links of the Week – December 7th! Do you mind if I quote a few of your articles as long as I provide credit and sources back to your website? My website is in the very same niche as yours and my users would truly benefit from a lot of the information you provide here. Please let me know if this okay with you. Thank you!